On the eve of BBC Question Time in Norwich, not just one political demo but two protests against the Government took place. One was anti-austerity/Tory and gathered outside The Open where filming was taking place. 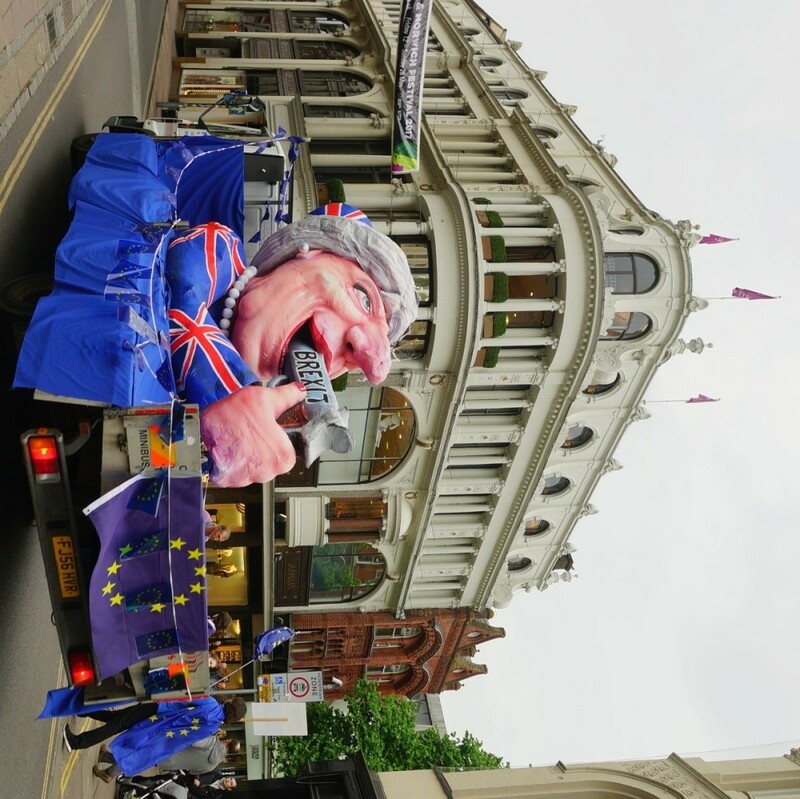 The other was anti-Brexit whose centrepiece was a German carnival float with the sensitivity of a French Charlie Hebdo cover in the spirit of Spitting Image satire – how about that for European unity! The humour was not to everyone’s taste, and as someone who has experienced suicide attempts, I found the subject matter challenging. 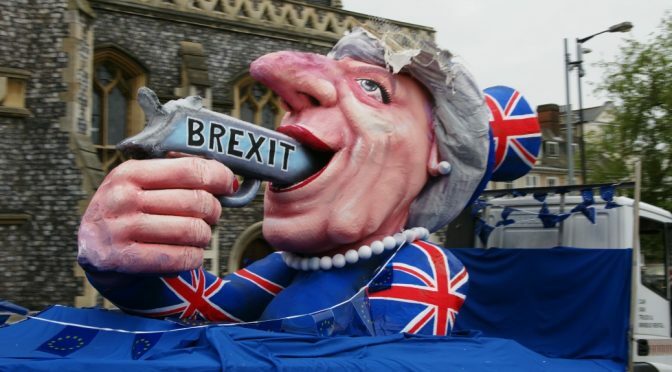 The image of Theresa May shooting herself in the mouth was meant to be about Britain committing political suicide by Brexit. Instead, the image was profoundly personal evoking strong reactions. 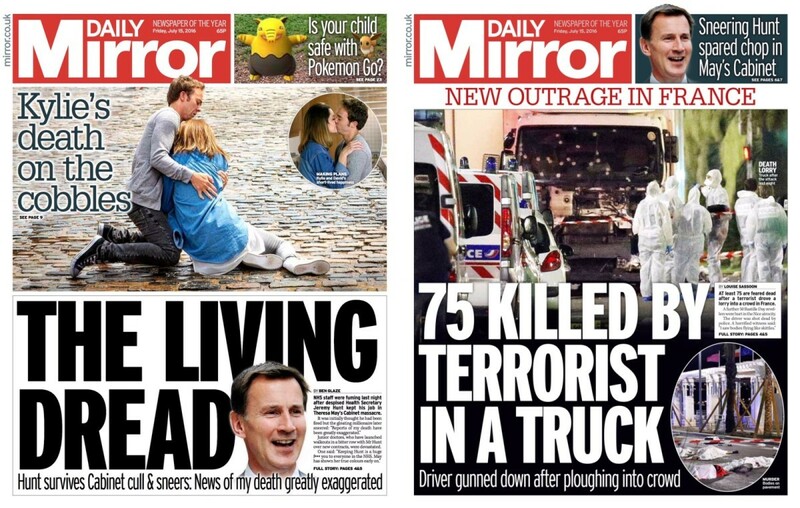 Perhaps, it should have been Britain shooting itself in the foot, rather than the mouth, it may even be seen as an own-goal. 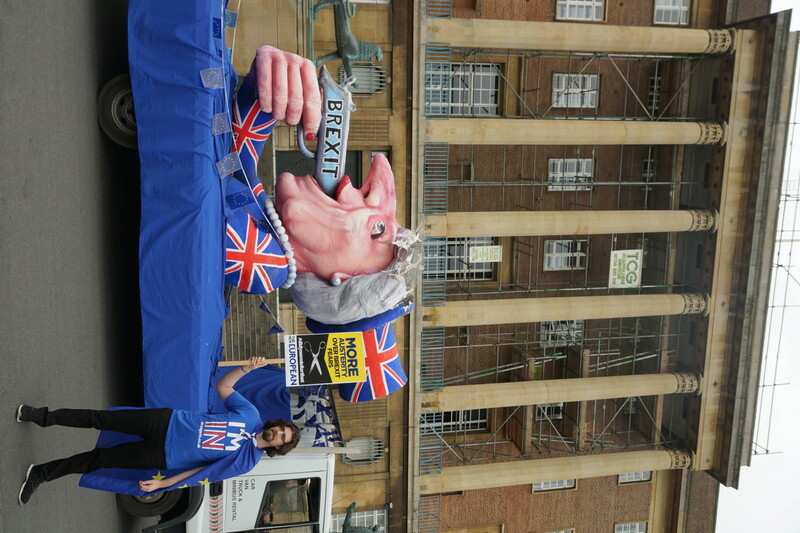 Some erstwhile Remainers refused to attend the rally as a result, others like myself had mixed feelings. During the evening I had several conversations with passers-by about suicide but few about Brexit. 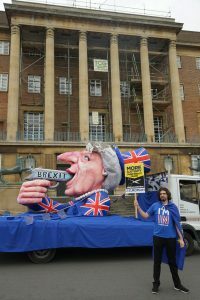 One car driver stopped and said he agreed with what we were doing and supported Remain but having lost a family member to suicide found the imagery distasteful. Another person found that it conjured up allusions of male-on-female violence. I critiqued that view and pointed out that male suicide by gun is a much higher figure than female suicide fatalities. Well, it created a debate, but perhaps not the one intended. Much as Antony Gormley’s recent rooftop-edge human sculptures up at UEA. “The message is clear: BREXIT IS TOXIC. And that I guess is at least something we all agree on. 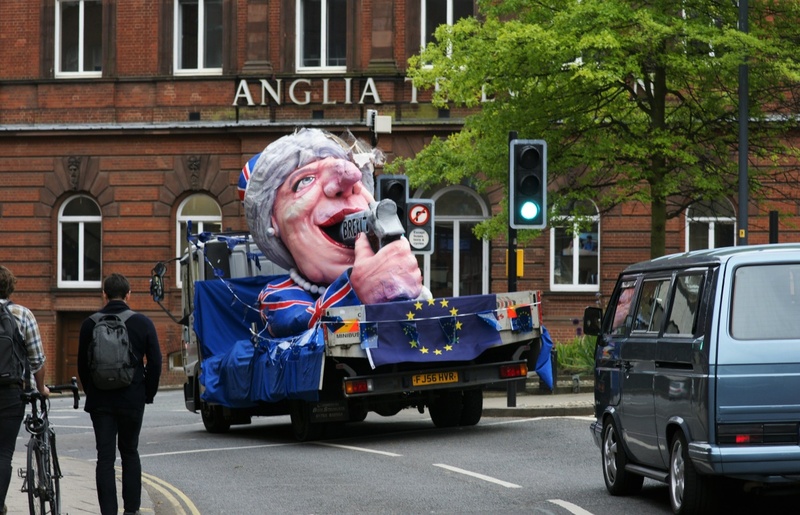 So this May’s float might not be everyone’s cup of tea in terms of ‘bad taste’ for some, however, I truly believe that it is so important for FREEDOM OF SPEECH to be respected and protected. Visuals such as the float or other creative means like some ingenious cartoons show humour through carrying angry voices and it is a way to soften anger too strong for words and at the same time be totally spot on in delivering a strong message. Humour is so important to cherish and use through tragedies and political dilemmas to also lighten up the atmosphere. 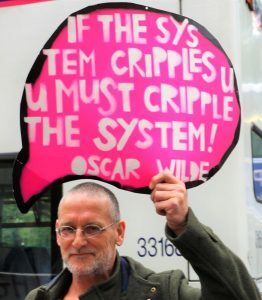 Likewise many creative placards that are conveying strong messages through cartoons of sorts, make an important impact in seconds and make people smile relating to that message or/and provoke a reaction. So what? I think it should. It is a way to be heard. 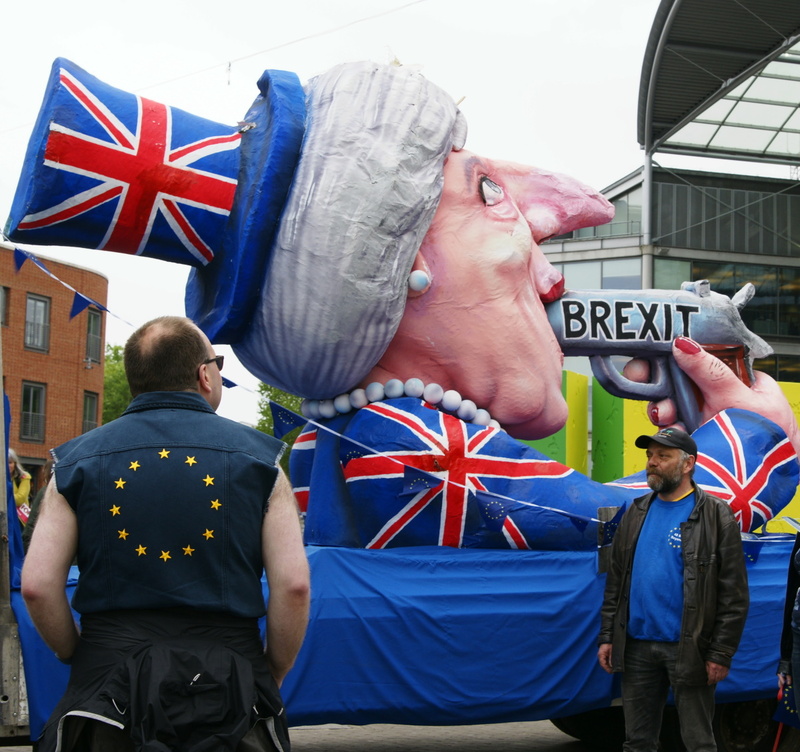 The satirical Karneval float created by Jacques Tilly depicts the British Prime Minister with a ‘Brexit’ gun in her mouth first debuted Düsseldorf Carnival in February and was subsequently used by the Unite for Europe campaign and March 2017 events in the UK. 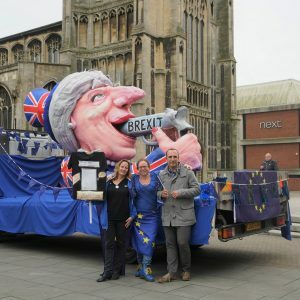 The float is currently on a British tour and arrived in Norwich on the same day as the BBC’s Question Time took place at The Open. 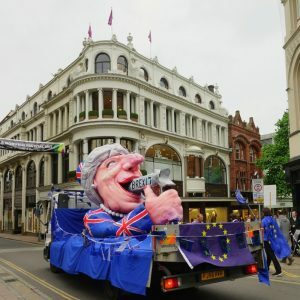 Düsseldorf’s Karneval regularly features political satire but this year with Donald Trump, Netherlands’ Wilders, France’s Le Pen, Turkey’s Erdogan, along with Britain’s Brexit, there was plenty of material. The stodgy stereotypical image of German humour is clearly way off the mark as these floats were right up Charlie Hebdo‘s street and could have walked off the Spitting Image TV set. 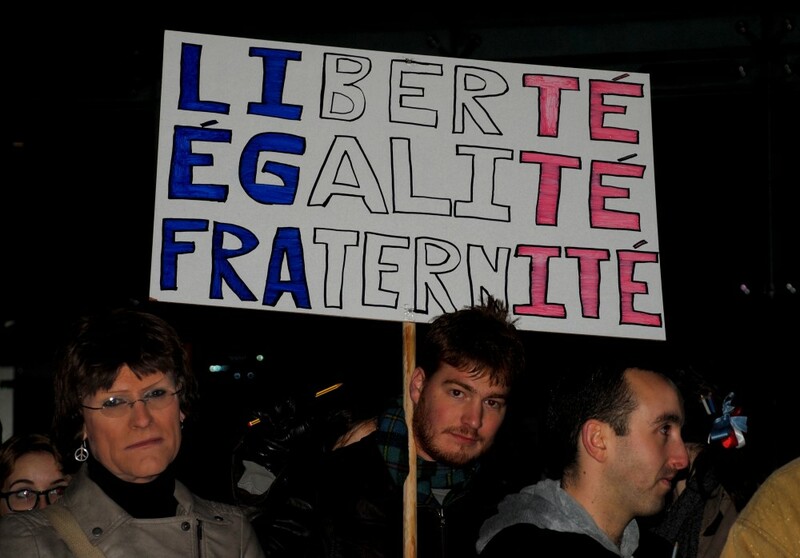 Humour, like art, both protests and provokes. I hope the conversation shifts away from the rather visible satirical attack on Theresa May and instead remains about the political and personal damage that Brexit may do to European relations and EU nationals living here, as well as threats to Britain’s prosperity and cultural tapestry. 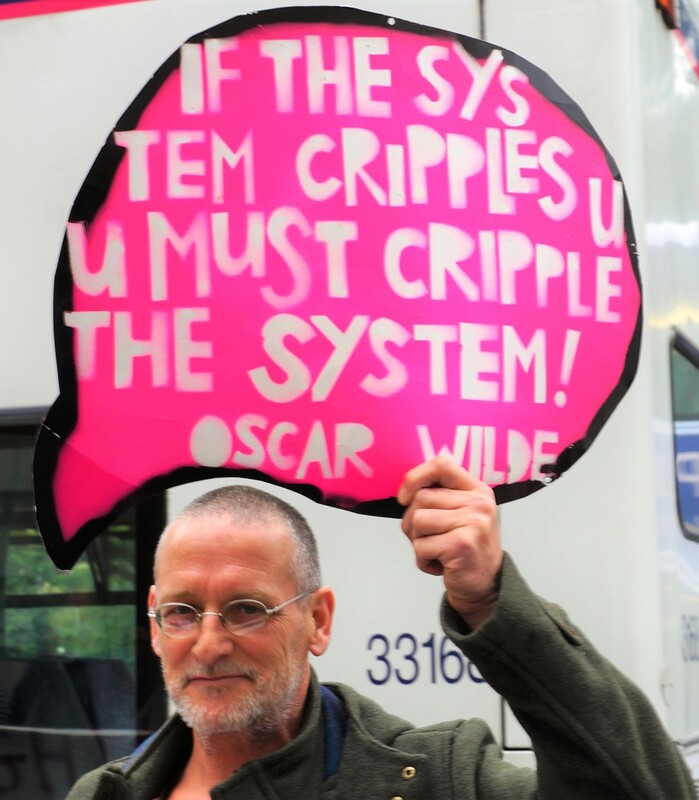 The serious message about austerity and cuts and their impact on the disabled, the poor, and the most vulnerable was also protested outside the BBC filming by Vince Laws, Jan McLachlan, Tim Hughes and many others. OK, so Vince made that one up, but the #fakenews quote got you thinking and googling its source! What Oscar Wilde did say was – “Quotation is a serviceable substitute for wit”. 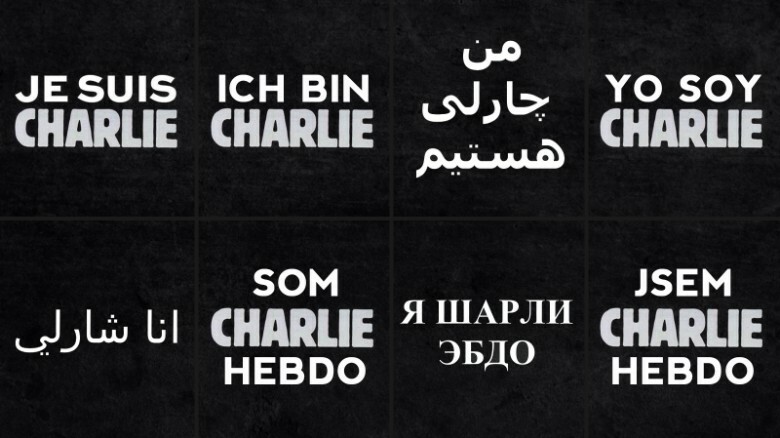 Charlie Hebdo continues to inspire both writers’ rage and courage. It is to receive a PEN award for Freedom of Expression Courage and yet half-a-dozen writers are already staging a stay-away protest. 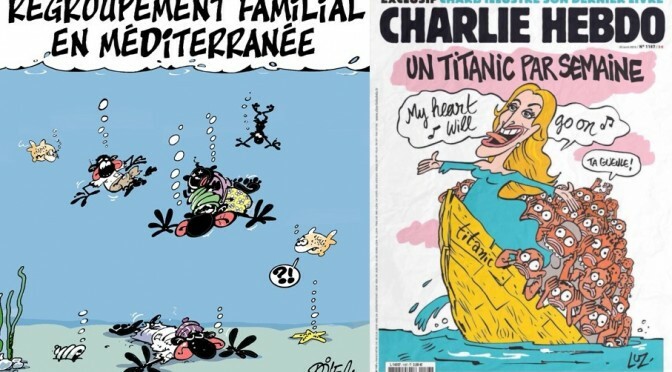 It has also been condemned for an apparently migrant-bashing cartoon that it turns out was neither anti-Mediterranean migrant nor by the satirical magazine anyway. C’est la vie mais pas la vérité! 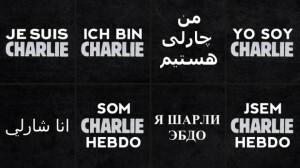 Following the terrorist attack on the Charlie Hebdo magazine offices in Paris in January this year, a social media and public protest campaign using the phrase “Je suis Charlie” went viral but also forced us to ask questions of whether satire always punches up or even gets it right at all. In all circumstances, and particularly in time of war, works of art, the patrimony of humanity at large, should be left untouched by national or political passion. Members of PEN should at all times use what influence they have in favour of good understanding and mutual respect between nations; they pledge themselves to do their utmost to dispel race, class and national hatreds, and to champion the ideal of one humanity living in peace in one world. 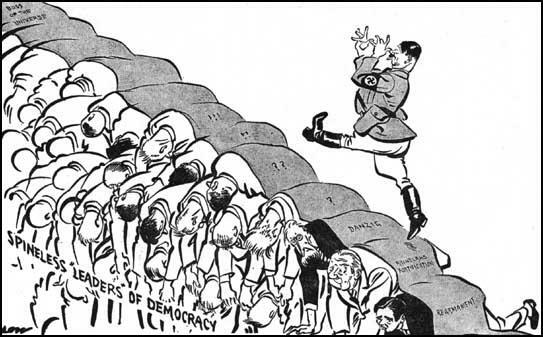 It is, perhaps, questionable whether Charlie Hebdo or indeed PEN are doing their “utmost to dispel race…and national hatreds” or increasing “good understanding”. There was some excellent and varied commentary upon the New Yorker piece on their Facebook page from French citizens bemoaning the lack of understanding of French satire and cultural context. PEN International is one of the world’s oldest human rights organisations and the oldest international literary organsisation. The American Center is its largest regional body. 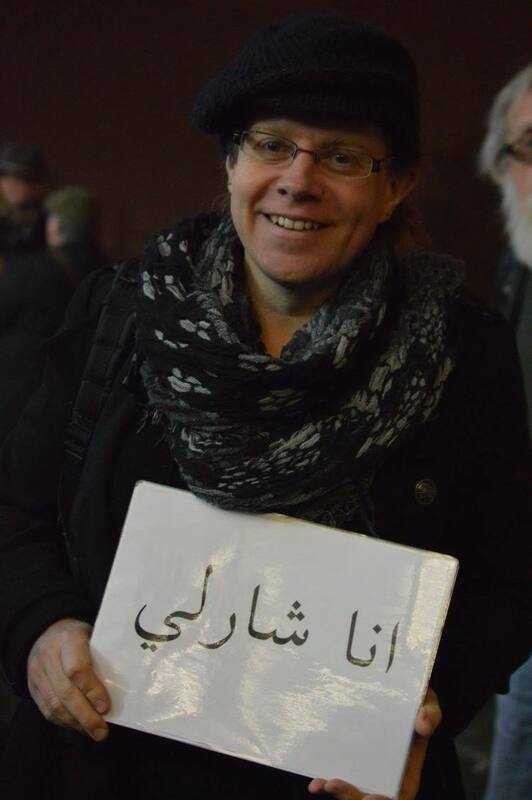 PEN advocates on behalf of writers denied their human rights for writing, such as Raif Badawi. 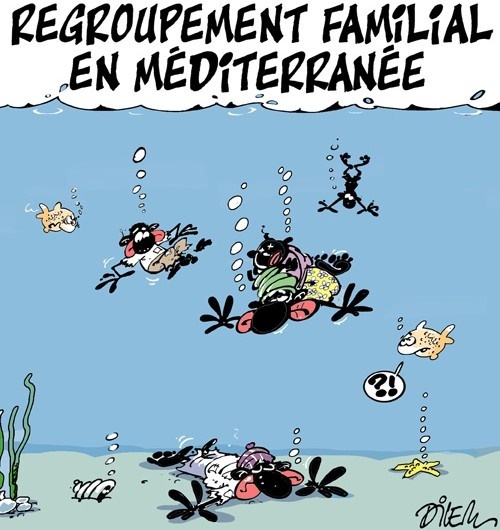 Charlie Hebdo was also, last week, condemned for a cartoon depicting drowning migrants (“people” for those of us with a streak of humanity) in the Mediterranean, on that platform of accurate factchecking – Twitter. 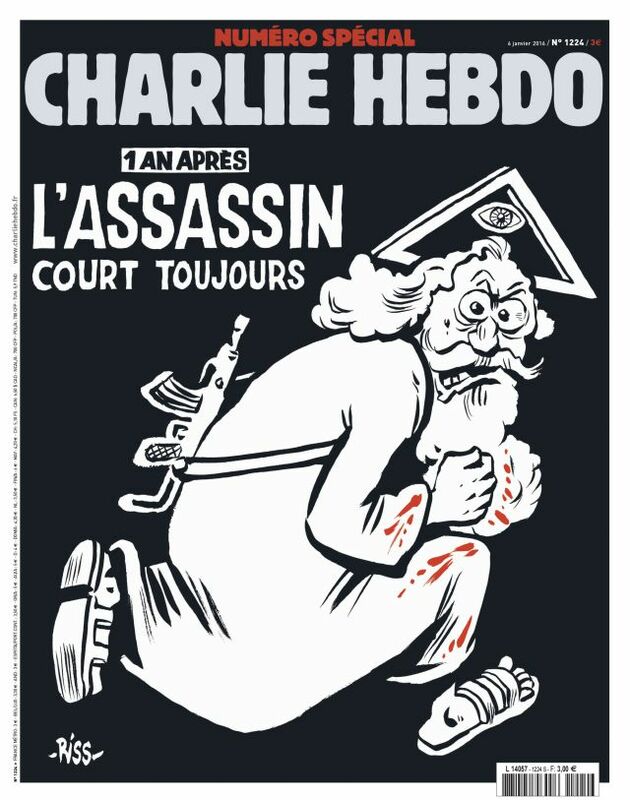 Except it wasn’t a Charlie Hebdo cartoon, just by one of their newer cartoonists and published elsewhere in a French-Algerian publication, Liberté. The gross caricaturing of African migrants in it seems to fail the “punching up” test and appears to mock a humanitarian tragedy at sea. 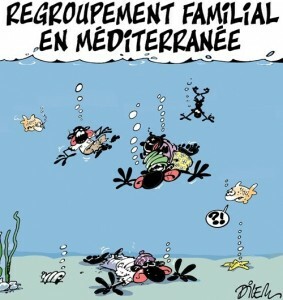 The double irony, however, was that the cartoon, condemned for racism among other things, was drawn by an Algerian, Ali Dilem, who was satirising French immigration policy (“regroupement familial”) and condemning the losses at sea because of that policy. Not everything is what is seems before we jump to judge. 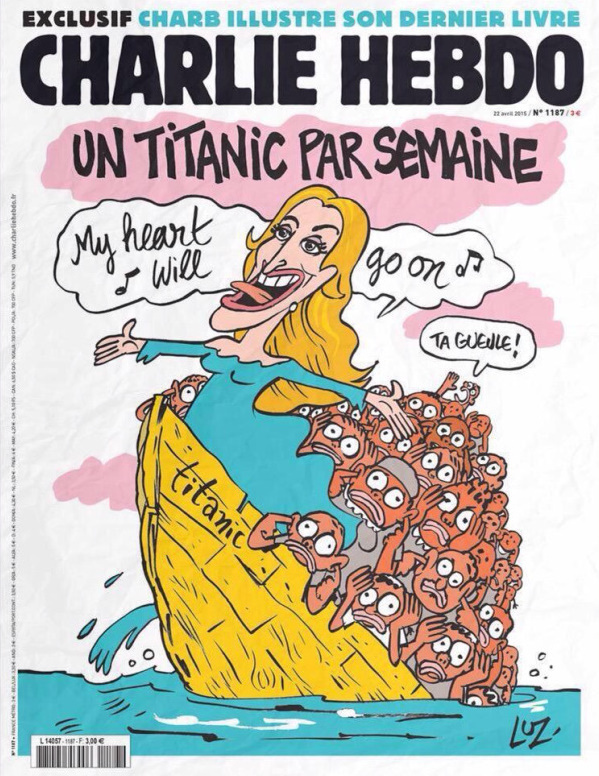 Furthermore, Charlie Hebdo has actually critiqued the Mediterranean migrants issue in its own cover-image cartoon based around the idea that a tragedy of Titanic proportions is happening each fortnight in the Med. Last year some 3,500 of 350,000 people escaping North Africa died at sea – that’s a similar number to the deaths in Nepal due to the recent earthquake. This year we’ve reached half than number in barely months. It is a whole other question – to which I don’t have an answer, of whether disaster and loss, tragedy and terrorism, should be satirically pilloried at all, and if they are, how. The right to offend should never be taken lightly, nor honoured without a thought to the consequences of what it may encourage. That is not to say that PEN is right or wrong in its award, perhaps that there might have been better, or safer, recipients. 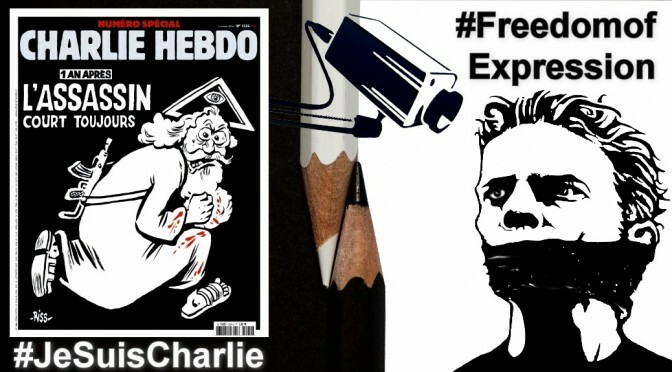 Playing it safe, though, is not what freedom of expression is about. 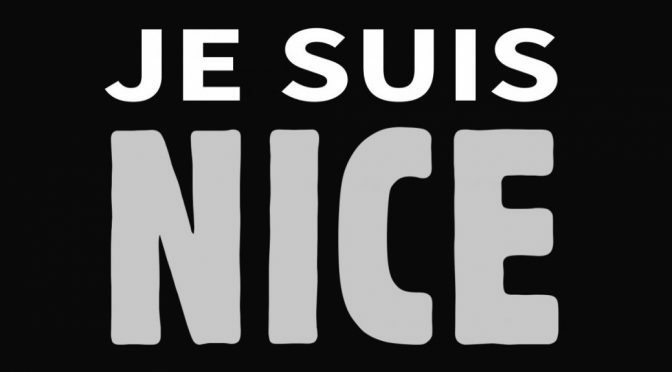 The right to offend, satirise, challenge, does not mean that we should always write it. Think it, yes, voice it perhaps, but disseminate it – that is a choice, not just a right. 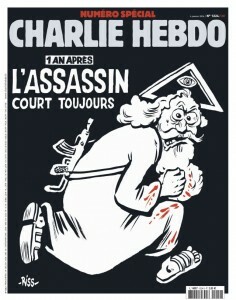 Rights come with responsibilities – though, none that would suggest the Charlie Hebdo attack was merited or justifiable. 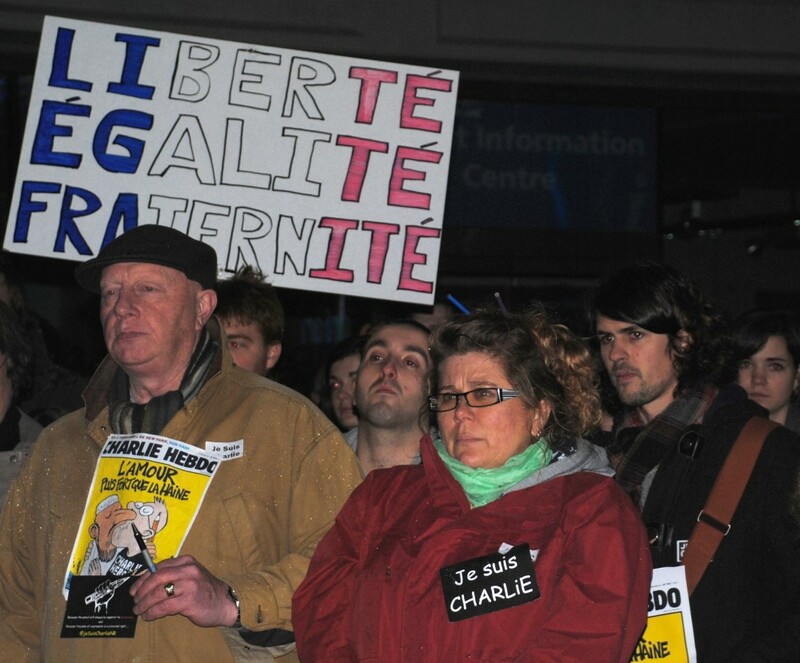 Around 200 people gathered in the rain and cold outside the Norwich Forum to stand with the #JeSuisCharlie victims in a poignant and peaceful vigil marked by respect for all beliefs, but especially of freedom of expression. This was Norfolk’s small but inclusive contribution after nearly 4 million people assembled in France at the weekend, 1.5m in Paris alone, only tarnished by the presence of leaders and foreign ministers from around the world, many of whom shackle freedom of speech and belief in their home countries. The Norfolk crowd, with a a few dozen French nationals studying or living here, assembled calmly outside the Forum, candles were lit to spell out “Charlie”, after an introduction by French organiser Clémentine Pellegrino – in which she quoted Albert Camus, there was a minute’s silence during which pens and pencils were raised aloft. There followed an invitation to those present for anyone to say or share something, some came with prepared words others seemed inspired with spontaneous speeches, each leading on from the last. People of varying backgrounds, political and religious beliefs, were represented. Several began their speeches in French. A woman from the local Liberal Jewish synagogue asked for raised hands from members of other faiths – Jews, Christians, Buddhists, not that I spotted anyone noticeably Muslim by any stereotypic dress. When I felt moved to speak, I spoke up for the hundreds of journalists around the world imprisoned or killed for publishing political or religious comment that may not agree with everyone. I mentioned the Al Jazeera journalists locked up in Egypt currently awaiting appeal against their sentence. I noted how many Arab papers and cartoonists had also drawn cartoons of support but also how the Syrian cartoonist Ali Ferzat had been beaten for criticising and caricaturing President Assad. I raised the hypocrisy of Saudi Arabia sending condolences and criticisms of the criminality of the terrorist attack whilst locking up and carrying out a sentence of a 1000 lashes upon Raif Badawi for setting up a Liberal political website. I mentioned the view against polarising this as a clash between civilisations, but instead one of a clash within them. 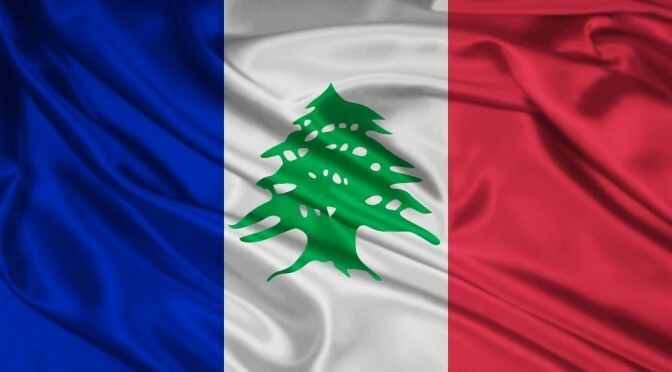 By far the majority of extreme Islamist victims have been Arabs and Africans, Muslims and Christians, not Western writers and commentators satirising religious figures. 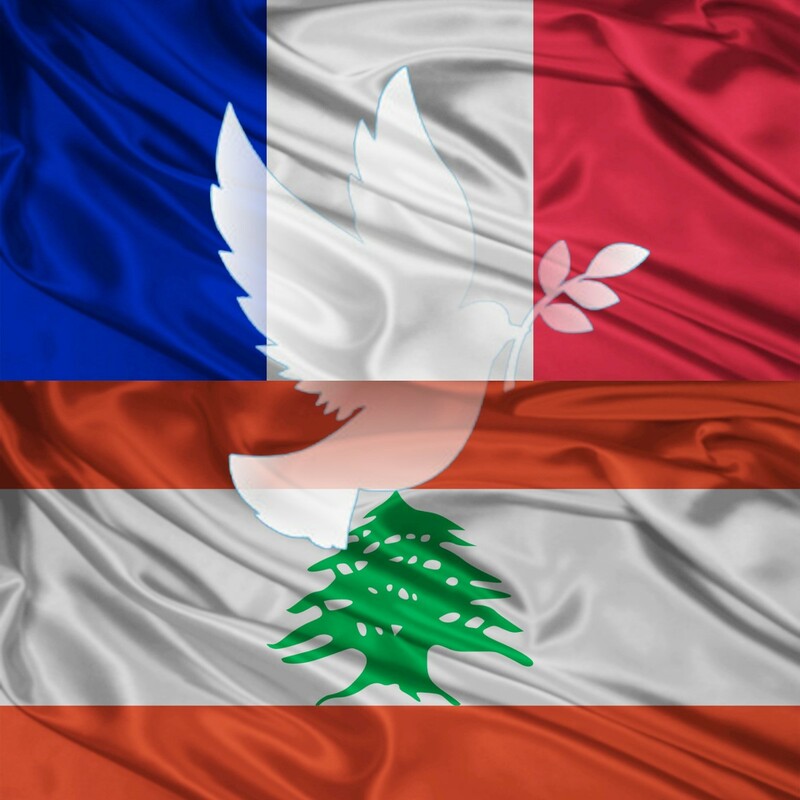 I also drew attention to the dozens of Arab and Muslim countries and organisations who did condemn the Parisienne atrocity as “Not in my name” and nothing to do with the tenets of Islam. 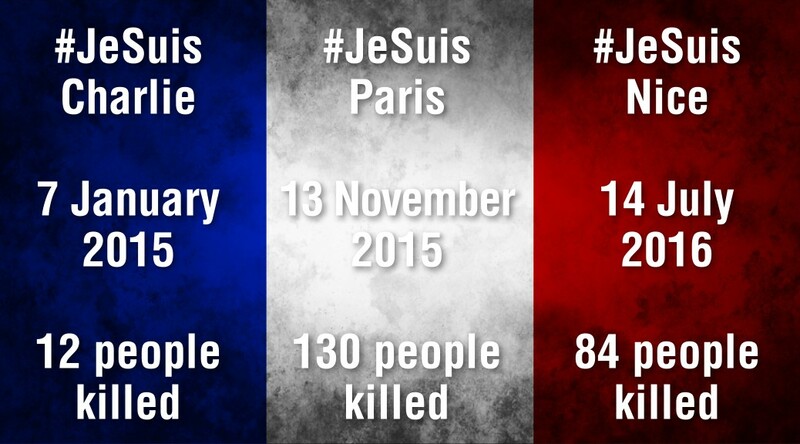 Because of this I carried not only #JeSuisCharlie placards but the same sign written in Arabic, along with #JeSuisAhmed – the Muslim policeman who died protecting the rights of others to criticise his religion, #JeSuisRaifBadawi; #JeSuisJuif for the Jews in the Kosher store who were also targeted – if anything that *was* a racist attack; #JeSuisMusulman to say I stand with peaceful Muslims, like the Australian #IllRideWithYou hashtag that trended after the Sydney cafe siege. Whilst I had also made a sign #JeSuisNigerian to remember the 2000 massacred in Baga a few days ago, as if African lives mattered less, I did not remember to mention it, but my omission was more than made up for when the local Police head of diversity, Abraham Eshetu, spoke about what had happened in Nigeria. There was no racism, or Islamophobia, at the event, no far right hijack as was feared by some, indeed quite the contrary, these were condemned amidst the solidarity against fear and violence, and for freedom of expression, belief, and speech. This was echoed by the organiser’s intent for a peaceful demonstration. It was sad that some did stay away as “Je ne suis pas Charlie”, because this movement of people, galvanised over social media, need not be hijacked by world leaders for their political ends, nor used by racists to rant against immigration, instead it should be an opportunity to stand up for diversity of belief and the rights to express them. It is probably forgotten that Charlie Hebdo also ran cartoons satirising the far right, Marie le Pen, not just the icons of all the major faiths and political leaders of all hues. 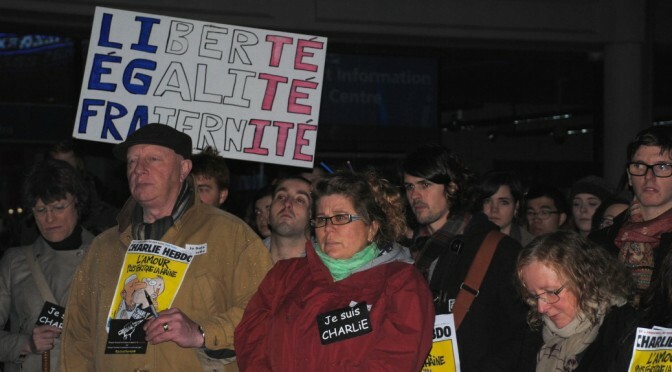 Despite, therefore, the very non black-and-white world of the #JeSuisCharlie stand for freedom, I was and am willing to be counted among the millions voicing their support, ensuring that all beliefs are free to be expressed, albeit with respect, yet open to criticism and humour. The right to insult, does not mean the need to do so. Challenging power structures and ideologies – religious or political, that oppress rather than attacking individuals or faiths in an ignorant blanket manner, is my preferred approach.